With the exception of the chough and the raven, the corvids are a widespread and common species. They have long been subject to human control by famers and gamekeepers in order to prevent damage to crops, livestock and game. This control has relaxed in recent decades and we have seen a substantial increase in the numbers of some species as a consequence. Corvid control has also been used, in combination with other predators, to conserve some local threatened bird. Until recently most gamekeepers believed that corvid traps were ineffectual. Since the GWCT believes in continually developing and refining techniques to ensure they are appropriate and effective so we took the initiative in the 1990’s and researched trap effectiveness and showed that corvid traps were a very successful tool; especially when used with a live decoy bird which also made them extremely species-specific. 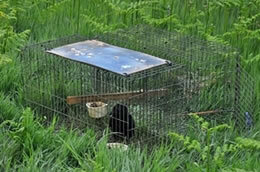 The GWCT used Larsen live capture traps as part of the conservation ‘toolbox’ in its scientific predator removal studies at Salisbury Plain, Otterburn, Loddington, and Royston. These revealed the heavy impact of common predators on wild gamebirds, waders and songbirds. The ongoing popularity of this humane and effective means of controlling corvids is its highly portable nature so it can be used for short periods of time during the breeding season and non-target captures can be promptly released unharmed. Besides conservation of wild bird species, there are several other reasons (such as the protection of livestock or livestock feed and food hygiene) why people may lawfully trap corvids. These are all clearly defined in the General Licence and GWCT factsheets provide more information on how to use traps effectively. It really is not very scientific to make a statement linking two events and presenting them as accepted wisdom. Corvid numbers have increased but it is too big a leap to claim that this is a consequence of "relaxed" corvid control. It is a fact that crow numbers have increased but according to the BTO “there are few specific studies providing evidence for the causes of the increase in this species, although evidence presented shows that increases in breeding success have been important. Ecological causes of this could be increases in food availability and the increasing suitability of urban areas (driving the species' expansion there), although specific evidence supporting these hypotheses is limited”. It is a similar picture with the other most common corvid, the magpie. A substantial increase from 1970 until 1990 and then stable with the biggest increase in suburban and urban areas. With most corvids (and other predatory birds), it should also be recognised that any increases are from a much lower base which was created by intense persecution from the latter half of the 19th Century until the First World War, related to management of land for shooting. This is probably inconvenient evidence for those that need to reduce predator numbers to produce sufficient numbers of game birds for shooting purposes and try to justify it by portraying a countryside awash with predators with predator control required to restore balance. Any scientific analysis of the impact of predators and the effectiveness of predator control, has to consider more than local impacts, especially for an understanding of long term bird population change. For thinking outside the Larsen Trap box, how about more goshawks as a cheaper and more effective long term solution to controlling crows. Now that would put the W into GWCT.